Specially constructed turntables utilizing stainless steel. These turntables are perfect for use where rust & corrosion are a problem. May be used on the floor or in racks and pits. Can be ordered with optional pointer. Sold in pairs. 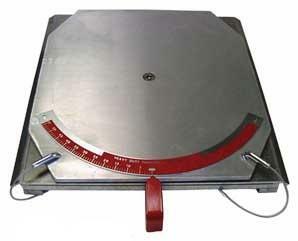 These Heavy Duty Aluminum Turntables are 65% lighter vs. comparable steel turntables that can weigh 110 lbs each. They make it possible to move you heavy duty alignment system from bay to bay or even site to site. Can be ordered with optional pointer (shown). Sold in pairs. These heavy duty turntables are perfect for normal usage. They come equipped with secure locking pins that are easy to use. For floor, racks or pits. Can be ordered with optional pointer. Sold in pairs. Full floating with enclosed ball bearings. Large, easy to read dial is quickly adjusted to zero. Pins are easy to remove and lock plates securely. Maybe be used as portable floor units or on racks and pits. Sold in pairs. This slip plate set is used in conjunction with the 99515 toe gauge. Made of steel, these slip plates allow the tire to move freely while the technician sets the toe. Sold in pairs. 99515 includes 10 in. extra-high stands, two standard 11 in. pointers, two long 17 in. pointers, an 8 ft. bar and WA516 scribe. This is a simple method for tracking the rear dual tandems on trucks and tractors. It includes the 91896 “U” Bolt Extensions, a pair of Lo Profile Extension Bars (91877) and a pair of 91888 Tandem Trailer Trackers. With this system the technician can easily check the A and D distances along with the B and C distances to see if the tandems are tracking correctly. The 91990 is a simple method for tracking the rear dual tandems on trucks and tractors. It includes the 91896 “U” Bolt Extensions, a pair of Lo Profile Extension Bars (91877) and 91890 Tandem Trailer Tracker Set for Aluminum Wheels. With this system the technician can easily check the A and D distances along with the B and C distances to see if the tandems are tracking correctly. The 91887 Lo Profile Extender Bar is designed to lower the measuring point of the tandems from the hub so that measuring the tracing of low profile trailers, such as car carriers and moving vans can easily be done. Can be used with either the 91888 or the 91890. Sold in pairs. These sets are used to aid in measuring the tracking of tandem axles in relationship to the kingpin suspensions and the front and rear axles on the tandem. Spring loaded and adjustable they establish a measuring point from the center of the wheel. To be used with 91889 and 91891. Sold in pairs. the trailer tandems (to be used with 91888 or 91990 and 91891). The trailer kingpin extension makes simple, fast, accurate measurements from the kingpin center to the trailer tandems. It is adjustable in length and has a spring-loaded cone that assures accurate holding to the kingpin (to be used with 91888 or 91990 and 91891). This trailer tandem tracker set for aluminum wheels, up to 28”, is used to aid in measuring the tracking of the tandem axles in relationship to the kingpin extension and the front and rear axles on the tandem. They fit on the outside of the wheels so will not damage aluminum wheels and you don’t need to remove the hub covers. Can also be used on steel wheels. Sold in pairs. 2 with 3/4” threads and 2 with 7/8” threads. Use with 91877 or 91889 and 91888 or 91890.